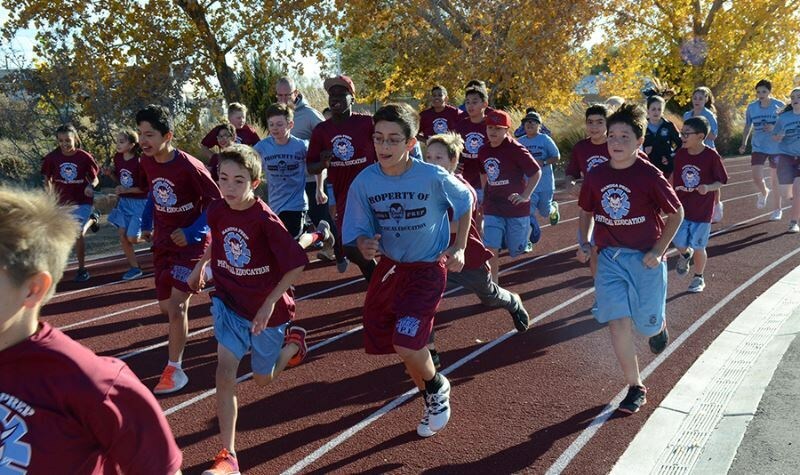 Athletics & physical education are an important part of Sandia Prep's well-rounded approach. All 6th through 9th grade students take physical education classes as part of a regular schedule, and Upper School students take additional P.E. classes during their 10th through 12th grade years. We also encourage SPS students to participate in our active team sports program. More than 70% of our students compete in team sports each year. In 6th Grade Physical Education, we teach our students basic movement and sports-related skills, such as ball handling, agility, balance, and hand-eye coordination so they may compete in, understand, and enjoy as many activities as possible. As part of this class, we also focus on lifelong fitness and wellness, and assess physical fitness throughout the course of their physical education. Among the activities we pursue are basketball, field hockey, soccer, volleyball, and track and field events. In 7th grade PE, we stress improving and refining individual skills and game strategies. We also introduce students to new and more complex skills, thus enabling them to develop confidence and a sense of mastery in the activities we pursue. We continue to assess physical fitness regularly and promote lifelong fitness and wellness. In the 8th grade PE class, we continue to focus on improving and refining individual skills and game strategies. while introducing students to nontraditional team sports, such as team handball, korfball, and ultimate Frisbee. We continue to assess physical fitness regularly and promote lifelong fitness and wellness. Our advanced physical education course is based on a health-related approach that stresses the importance of lifetime physical fitness and wellness. In this course we focus on lifetime activities such as tennis, racquetball, golf, and archery, aerobics, yoga and fitness training. Additional information is presented regarding nutrition, injury prevention and management, and current health-related topics. Outside speakers are brought in to provide information to students on topics such as Drug and Alcohol Awareness and Sexuality. Classes meet four of the six days in the cycle. Fitness for Life is an elective Physical Education Course designed to introduce the student to different aspects of physical fitness that will be applicable to daily life for the rest of their lives. Through the use of a variety of activities, the student is exposed to the main components of physical fitness, including agility, muscular strength, muscular endurance, flexibility, and cardiovascular endurance. Fitness for Life may be taken in a semester-long format or a year-long format, with the other choice being traditional PE classes. Activities include, but are not limited to weight training, yoga, pilates, speed training, plyometrics, and aerobics, which will occur in specific time frames. Students will demonstrate capabilities of analyzing fitness components, goal-setting and applying classroom activities to their general well-being.